Create a calming atmosphere in your home or office with this small zen garden and Buddha statue decoration. A sleek wood tray provides a raised platform that keeps sand and rocks neatly contained, and the other decorative pieces can be arranged in all kinds of creative ways. With an incense holder and tea light candle dish included, this decoration can help bring soothing aromas and a peaceful ambiance to any space. Exotic zen garden and Buddha statue decoration. For soothing aromas and a peaceful ambiance to any space. 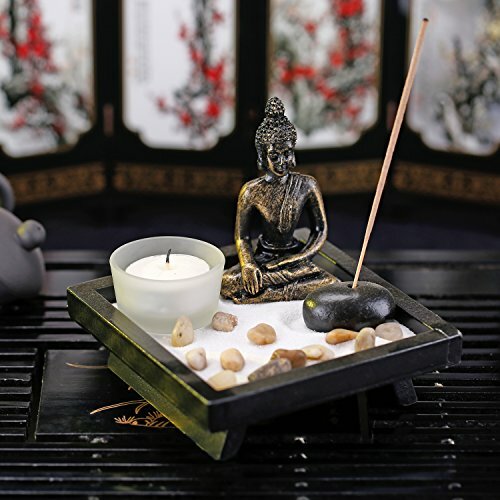 Display is neatly contained within a sleek wood tray and includes a Buddha statue, incense holder, tealight candleholder, decorative rocks and sand. Incense Burner,Copper Incense Holder,Ice-Patterned Khaki Yellow Handmade Censer, Incense Burner for Stick Incense/Cone Incense/Coil Incense.